If notice any changes in your dog’s nose color, there’s probably no need for alarm. A nose that’s normally dark can change color for several reasons. It may look pink or brown. Sometimes, the season is the reason for the change. The change can occur in the colder months. This is due to pigment loss because of the temperature. Sunburn can also cause a problem. Applying sunscreen can help. 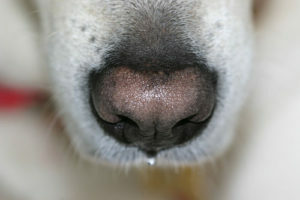 Some noses are sensitive to plastic food and water bowls. This can cause contact dermatitis. Normal color may return if you change the food and water bowl to steel or ceramic. If your dog seems healthy, in every other way, nose color changes are probably not a problem. If there are other symptoms such as a loss of appetite or listlessness, see your veterinarian. Alexa “Play Edgewater Gold Radio.” That’s all you have to say to hear the best oldies of all time. The music always flows on Edgewater Gold Radio. Listen from our website, Edgewatergoldradio.com or download the free Edgewater Gold Radio app! This entry was posted on Wednesday, February 6th, 2019 at 9:29 am	and is filed under Pet Supplies. You can follow any responses to this entry through the RSS 2.0 feed. Both comments and pings are currently closed.